A few days back I first time ate Chicken Chow Mein in a restaurant then I came to know how chow mein looks like. I planned to give it a try at home so I made and amazingly the taste was even better then the restaurant made. 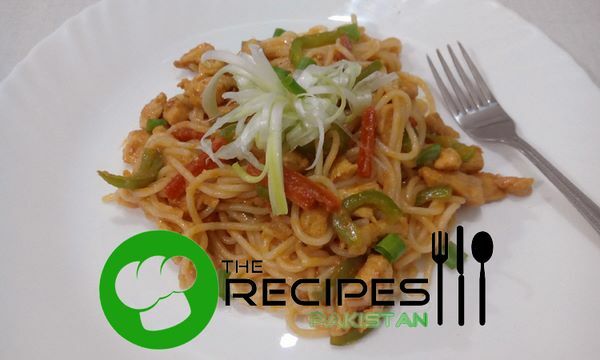 I made Chicken Chow Mein Recipe a little spicy :D. I used Peri Peri Sauce 2 tbsp in it for a mouthwatering taste ;). But in this recipes I didn’t mentioned about the sauce so if you want you can skip chili sauce with peri peri sauce. Must try this mouthwatering spicy Chicken Chow Mein. Marinade chicken strips with red chili, salt, coriander powder and lemon juice and leave for 30 minutes. Heat oil in pan and cook chicken for 3-4 minutes then add both capsicum and carrot and cook until chicken and veggies are tender. Add splash of water if required. Set aside. Heat oil in pan, saute ginger garlic paste, put in ketchup, chili garlic sauce, hot sauce, vinegar and salt. When start bubbling add in chicken and veggies. Then add boiled spaghetti and toss gently.